The first known use of halotherapy was by the ancient Greeks and Ayurvedic culture in India. Hundreds of years ago, European monks observed that patients treated in salt caves recovered rapidly from illness. In the 1800’s, the Polish government documented that salt miners were not only more healthy than coal or metal miners, but even healthier than the general population. During WWII, salt mines were used in Germany as bomb shelters, where asthmatics noticed their breathing improved. By the 1950’s halotherapy was being scientifically studied in Russia. Soon after, halotherapy ‘salt rooms’ or ‘salt chambers’ were being constructed above-ground to recreate a salt cave or salt mine environment. A study recently presented at a Vienna medical conference found that a tabletop salt generator helped prevent colds. So what’s so special about salt? It’s all about the ions. Salt is full of negative ions. Positive ions (a.k.a. free radicals) are created by things like appliances, t.v. and computer screens, fluorescent lights, and air conditioning. Positive ions make us feel tired, irritable, depressed, and can even make us sick and age us prematurely. Dr. Albert P. Krueger was a bacteriologist, microbiologist, immunologist, pathologist, M.D. and Professor at the University of California who studied air ions over a 25 year period. He found that high concentrations of positive ions increased the death rate in mice with existing fungal, bacterial, or flu viruses, while negative ions had the opposite effect. Dr. Krueger also noted a reproducible and significant change in blood and brain levels of serotonin (the ‘happy hormone’) based on ion density. And Columbia University studies found that negative ions were as effective as antidepressants to relieve winter and chronic depression. Have you ever wondered why you feel so good after a thunderstorm, by a waterfall, in the mountains, or at the beach? It’s not just the beauty of nature. Lightning creates negative ions, as does the pounding surf at the beach or falling water. A pine forest has about 40 times more negative ions per cubic centimeter than city air during rush hour. Negative ions even support healthy, beautiful skin. A study conducted by Dr. Arudoman of Germany found negative ions help to reinforce collagen in the skin. Local esthetician, educator, and author Shelley Lotz states that skin conditions such as psoriasis, rashes, eczema, & acne can also be improved with halotherapy, and that pure mineral salts have natural moisturizing and strong rejuvenating properties. Halotherapy is now used all over Europe and Scandinavia in spas and health sanatoriums for overall wellness, and is beginning to gain ground in the USA with about 200 salt therapy rooms. Come experience the many benefits of halotherapy in Ashland’s only salt cave sanctuary constructed with 3,000 pounds of Himalayan salt at the Zagorska Oasis Spa & Apothecary. We are located on the corner of East Main and Pioneer in a downstairs retreat. 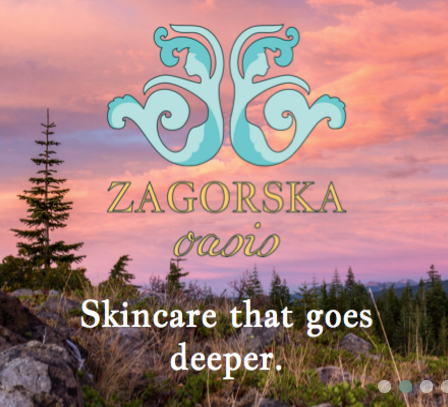 You can book your appointment online at www.zagorskaoasis.com or call 541-810-8877.